Easter Springtacular was a morning full of smiles, laughter, and family. The weather made the day, April 1, just about perfect! Fun games and activities made up a lawn full of happy kids and smiling parents, and in case you missed it, here’s a first-hand look at the day’s events. The petting zoo is always full. Some kids chase fearlessly after the chicken and rabbits. While another little one tentatively reaches towards the turtle her dad holds, unsure if she should touch it or retreat quickly. This a spot for the most adorable pictures, tiny animals and humans together. The Bunny Hop sack relay starts slow but the volunteers helping with the game are persistent, and soon kids are racing against one another. Careful balance is important for the Egg Relay on top of your head. Walk slowly and turn around the cone for the Spoon Relay. Hint: if you hold the egg, it won’t ever drop from the spoon! Face painting is always a popular stop. Kid’s running around UBC grounds can be seen with butterflies, rabbits, and other fun designs on their faces. The Girls in Action (GA’s) always provide a craft and cookie decorating for our preschoolers. Soon, these preschoolers may become a GA’s or an RA’s and help at this event learning to serve others. In the middle of the action, there is a prayer tent. Parents and grandparents come, and it is a special moment to be able to pray over the families and their lives. Egg hunts may be the most anticipated part of the whole day. Divided into age groups, infants through one year are first up. Yes, this is as cute as you’re imagining! Parents bring eggs to the babies who don’t crawl yet, mostly so they can chew on them. 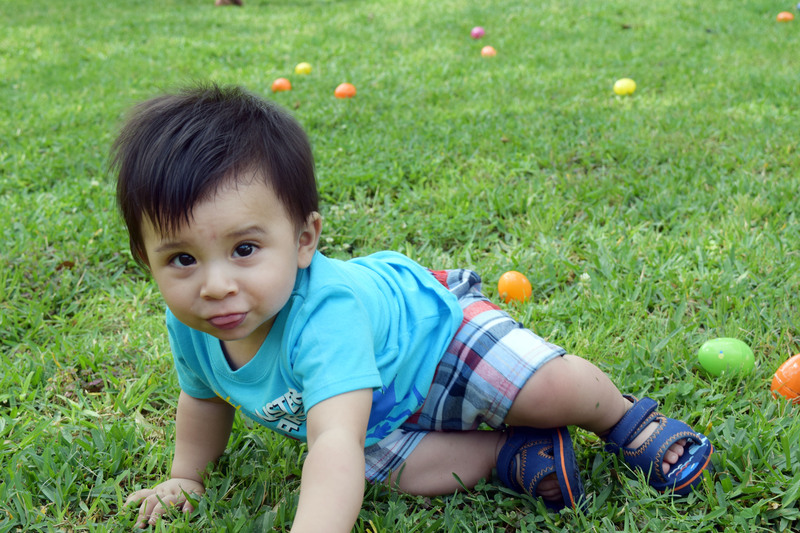 The babies that can crawl or walk, toddle their way to the colorful eggs. Next, comes the two and three year olds. They are a little faster and as excited as can be. Many stop to open the eggs and see what’s inside, not realizing they are allowed to gather more. The last group is four years – Kindergarten. This is over before you can blink! They are fast and determined to get as many eggs as possible. Who got the golden egg with a surprise inside? Over 650 people were on our campus enjoying free hot dogs, popcorn, and fellowship with one another. Thank you to all who came. We love beginning the Easter season with a morning of celebration and fun! Thank you to all the volunteers – we couldn’t do it without you. You make the morning extra special for the parents and kids!